The perfect girlie getaway is waiting for you and your friends on the Camino. Get away from it all and have some time to indulge in some light walking, relax in gorgeous accommodation and enjoy the sumptuous flavour that is Roma. Upon arriving at Roma airport, you will be picked up and brought to your hotel in Sutri, a small town 50km outside Rome, which is dotted with roman ruins and artefacts. Your hotel in Sutri, the ‘Agriturismo Montefosco’ is a traditional building situated in the Italian countryside, and also features a swimming pool. Upon arrival you will be greeted with a complimentary glass of prosecco. On your first walking day you will trek 25km to Campagnano di Roma a small market town outside Rome. Here you will stay in ‘Ristorante – Albergo da Righetto’, a quaint hotel in the town centre. Shoppers can enjoy the local market before setting out for Isola Farnese the following morning. In the town of Isola Farnese you will stay in the beautiful Tempio di Apollo, a hotel which is immersed in the natural park of Veio. For dinner you will experience traditional Italian pizza in a popular pizzeria where the Fiorentina is a speciality. Your stay in Isola Farnese will be your final country retreat before you arrive in Rome. You will travel by train to Rome the next morning and enjoy a spot of shopping. Rome is a shoppers paradise and boasts the flagship stores of some of the biggest names in Italian fashion such as Fendi, Valentino and Bulgari. Boutiques by Prada, Armani, Versace, Ferragamo, Cavalli, Gucci, and many others also line the streets near the Spanish Steps. Via Condotti is Rome’s main drag for haute couture and ‘aspirational’ window shopping, though you’ll also find high fashion beckoning from the boutiques on Via Borgognona, Via Frattina, Via Sistina, and Via Bocca de Leone. Your night in Rome will be spent in Hotel Camp de’ Fiori, a beautiful boutique hotel which is in close proximity to the city centre and the Piazza Navona which is famous for the Trevi Fountain. 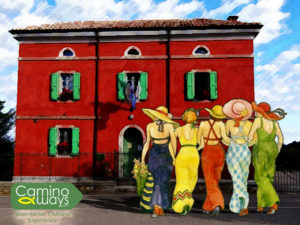 This girlie getaway is available now from CaminoWays.com, the walking and cycling holiday specialists, from just €650pps and €790 for single. So round up the girls and make your booking for this wonderful trip. Price includes:Airport transfers from to andfrom Rome, 4 night’s accommodation on a half board basis, free prosecco on arrival and a holiday pack and ground-assistance.